St Benedicts - University Degree vs Degree Apprenticeship: which one is right for you? With the increased uncertainty around Brexit, employability and student debt, St Benedict's Careers Department wanted to help clarify for parents and pupils the advantages and disadvantages of studying for a traditional university degree compared to a degree apprenticeship – and how to access the different routes available. Kathryn Norris, Careers Officer, reviews the event. 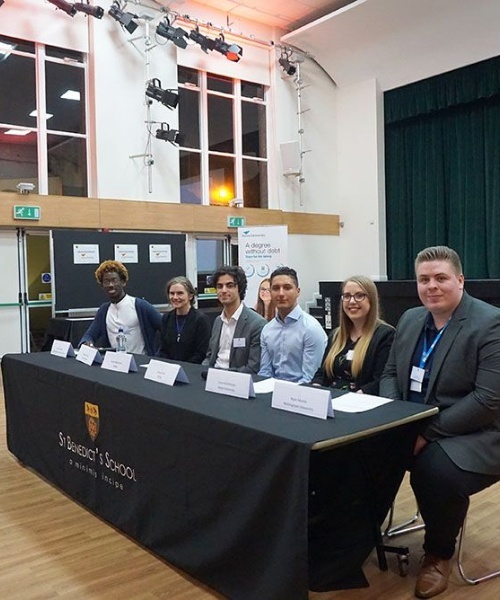 So, on the evening of 19th March, St Benedicts Senior School welcomed five very different providers: the University of Nottingham (Russell group, with campuses in China and Malaysia); Aston University (a major education partner and pioneer in apprenticeship degrees); Cap Gemini, KPMG and the National Apprenticeship Service. We were also delighted to welcome 50 pupils, parents and teachers from Cardinal Wiseman High School. Billed as a university vs degree apprenticeship tussle, the evening’s wrangling began with an overview from Mrs Hopgood, Head of Careers, on the how economic conditions and uncertainty will affect education providers as well as education consumers, and what this might mean for the future of social science and arts degrees as well as the growth of degree apprenticeships. Aston described apprenticeship degrees as the best of both worlds: a real university on campus experience for part of the year, being taught the same modules in the degree as full time students, at the same time developing transferrable work place skills. The University of Nottingham - a member of the Russell Group with campuses in the UK, China and Malaysia and ranked 11th overall in the UK in the 2019 QS Graduate Employability Rankings – made the case for time wholly dedicated to higher education – opportunities for personal exploration and development, the development of specific skills and access to particular career routes. 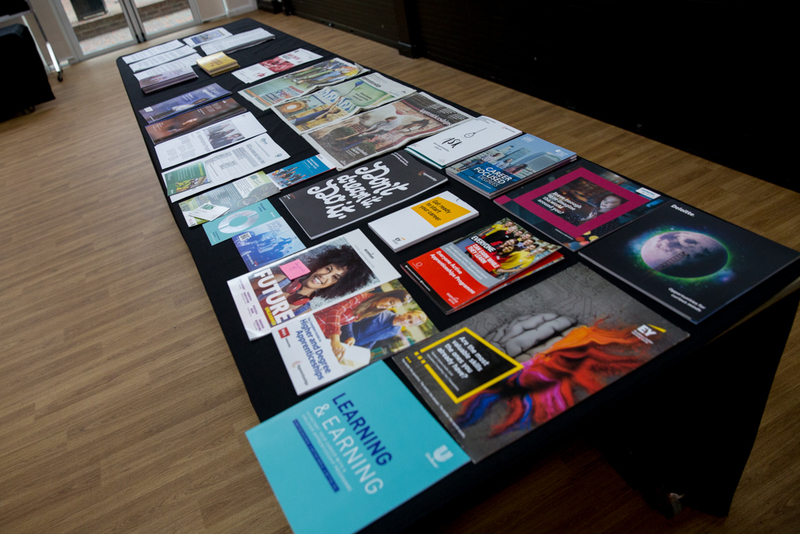 With degrees from faculties covering Arts, Engineering, Medicine and Health Services, Science and Social Sciences, Nottingham highlighted that particular careers simply require a degree (for instance, law) and progression can be faster by acquiring the qualification and moving on to the postgraduate element of training. Similarly medical students need to require a bedrock of knowledge before they can be expected to participate in patient care. Degree apprenticeships will not suit pupils who struggle to get into school on time or to balance their studies with other commitments. Although the benefits of a ‘No Fee Degree’ are very attractive, pupils will need to be hardworking employees and hardworking students to make the grade. By contrast, Aston University sits in the top 100 world ranking for Business and Management Studies and is leading the way in supporting apprenticeship degrees: the objective is for 25% of all places to be supporting apprenticeship degree routes. Aston described apprenticeship degrees as the best of both worlds: a real university on campus experience for part of the year, being taught the same modules in the degree as full time students, at the same time developing transferrable work place skills. No debt and a real salary compensated for the fact the degree would take a little longer to earn. The University of Nottingham ... made the case for time wholly dedicated to higher education – opportunities for personal exploration and development, the development of specific skills and access to particular career routes. From KPMG, we had the positive view point of a recently recruited degree apprentice (ex-Millfield, June 2018). As one of the Big 4 accountancy and advisory firms, KPMG is also in the top 10 of The Times Guide to Higher and Degree Apprenticeships; and Derrick Otchere, of the National Apprenticeship Service, also gave an overview of the benefits of ‘on the job’ learning: the ability to practically apply theoretical learning from the outset; the growth in personal confidence; the ability to gain a careers headstart against former class mates in full time education who were not yet developing the same range of personal skills. The last stage of the evening was a Question Time style panel discussion with questions from the audience focused on how to find and prepare for degree apprentice applications and how the applications process could be managed so that it did not unduly trespass on study time. Questions also covered how the NAS lists and acts as a general applications portal for higher as well as degree apprenticeships, and how we can support future students in developing the digital interview skills that will be required generally in the work place as well as to secure a degree apprenticeship. The National Apprenticeship service offers an overview of all apprenticeships for school leavers at 16 and 18, including Higher Level apprenticeships and sponsored degrees as well as other professional qualifications. The service acts as a general applications portal as well as offering advice on interviews and identifying the appropriate course.